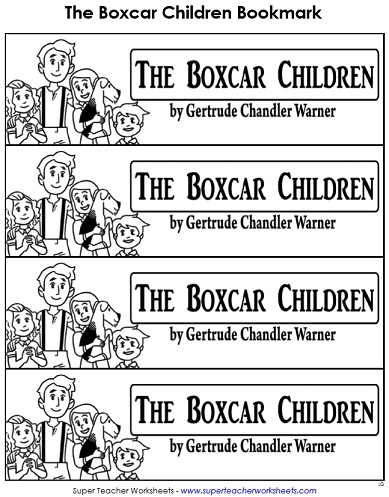 This literature unit contains worksheets and printable activities that you can use when reading Gertrude Chandler Warner's novel, The Boxcar Children. This unit includes reading comprehension questions, vocabulary worksheets, puzzles, and literature circle resources. 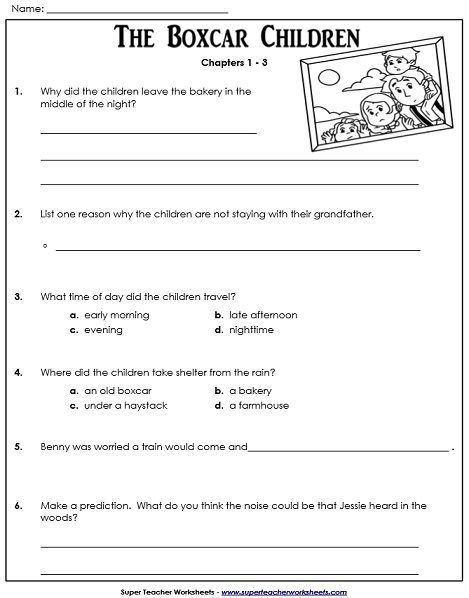 Read Chapters 1-3 of The Boxcar Children and answer the comprehension questions provided. Questions are a mix of multiple choice and short answer, and touch on important events in the story. Read each sentence and look up the definition of the underlined word. Write the definition on the lines provided. Words include boxcar, brook, and politely. Print and cut out the vocabulary word cards and definition cards to review the vocabulary words from chapters 1-3. After reading Chapters 1-3 use this writing prompt to encourage students to connect to the story. The children have started to settle into their new home. In this activity students will answer questions about their daily lives, and how they have learned to survive on their own. Can you match each vocabulary word from the story to the correct definition? Words include hem, kettle, admired, and treasures. Use these printable vocabulary cards to practice the words from chapters 4 through 6. Laminate the cards to reuse them over and over. This picture shows a scene from Chapter 4 of the book The Boxcar Children. Write a few lines explaining what is happening in the picture. Want an extension activity for your students? Consider using this writing prompt to engage learners in creative thinking. After reading chapters 7-9, try answering these comprehension questions. 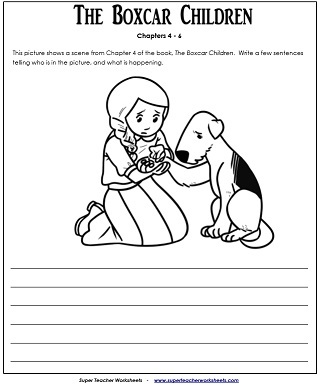 This printable worksheet will test your understanding of the events that occur throughout these chapters. Read each sentence. One vocabulary word in each sentence is underlined. Choose the correct definition for the underlined word. This printable file has 12 cards (6 word cards and 6 definition cards) to use for vocabulary review from chapters 7 through 9. Allow students the opportunity to connect the story to their lives. This writing prompt asks students to relate to the scene where Henry builds a swimming pool in the brook. Many things are revealed in the final chapters of the book. This activity asks students to recall those events to answer the questions. Fill in the missing letters to create a vocabulary word from the story. Use the clues for help. Words include bleachers, crossly, growl, and mills. The vocabulary words for chapters 10 through 13 include: crossly, bleachers, mills, homesick, and growl. These printable cards will help students memorize their definitions. Do you think you know the The Boxcar Children? This file has a mix of multiple choice, short answer, and matching questions based on the book. Tell which character from The Boxcar Children is the speaker for each quotation. Can you unscramble these vocabulary words from "The Boxcar Children"? An answer key is included. Print these bookmarks on card stock and give them to students when you read The Boxcar Children. Each bookmark has a picture of Jessie, Henry, Benny, and Violet. The question leader writes and discusses questions for the assigned chapters. He or she then leads the discussion group. The illustrator draws a picture of a scene from the story. Other members of the group discuss the drawing. Write a summary of the assigned chapters. Read it to your group, then discuss. Students make connections between events in real life and the story. The word wizards finds challenging vocabulary words from the assigned chapters. Then he or she researches the definitions of the words. This is the cover page to the literature circle packet. It includes pictures, and a space to list all students in the group. STW has a large selection of chapter book literacy units. Titles include Charlotte's Web, The Phantom Tollbooth, Frindle, The Giver, Mr. Popper's Penguins, and many more. This page has a literature unit to go along with the novella, Sarah, Plain and Tall.